I was so excited about seeing the Who. They were at the height of their powers in the early ’70s and, along with the Stones and Zeppelin, were easily one of the greatest rock bands in the world, and they knew it. In fact, in many ways they were the best band in the world. Their performances, or at least the ones I witnessed, were consistently solid, and they had great pop tunes, and class rock tracks to draw from. As showmen and musicians they were all individually excellent. Pete Townshend was the angry young man, stomping around the stage, swinging his arm like a windwill, and I was always hoping to see him smash his guitar, as we had witnessed in the “Woodstock” and “Monterey Pop” films. Roger Daltrey was the ultimate front man; his mod style had developed into a full-on rockstar, with his suede fringed suit, throwing the mike out to the audience and immediately pulling it back to twirl around his head. John Entwistle was the solid, silent, excellent bassist with the deep voice that would emerge in “Boris The Spider” or “My Wife”. And Keith Moon, was the mad, hyper active kid, who would bash away at the drums, grin at the audience, and every now and then interject a few random jokes. Tickets for concerts at Newcastle Odeon were sold at The Queens Theatre. I went through to buy tickets on the morning that they went on sale, only to find that the queue was absolutely massive, stretching around from the Queens, across the square where the city library now stands and right down the next street. I joined the queue but realised that I had little chance of scoring a ticket. The box office opened and people starting emerging with their tickets. One guy came down the queue with a few spare, offering to sell 50p tickets for £1. I bought one. It was a rear stall ticket, not a particularly good seat, but I was in 🙂 ! I was delighted and counted the days to the gig. 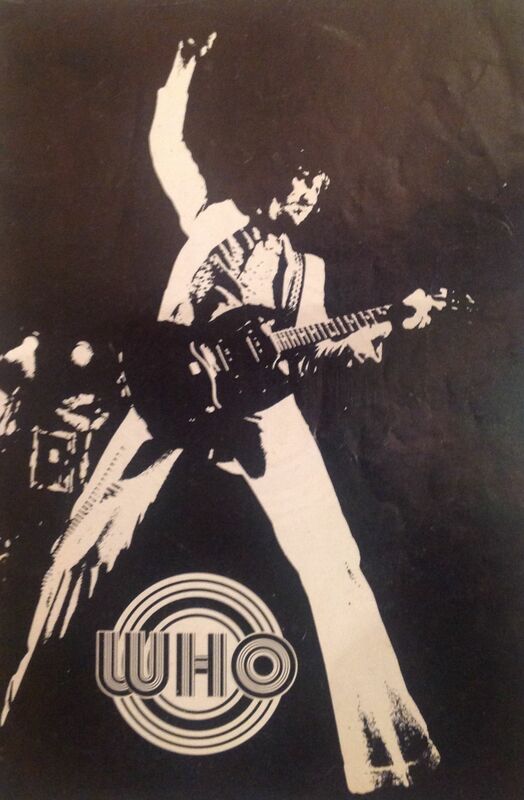 The Who began their short Autumn 1971 UK tour at the Free Trade Hall, Manchester, and concluded it at Greens Playhouse (The Apollo) in Glasgow, Scotland. They also played three nights at the Rainbow Theatre in Finsbury Park, North London, the first events taking place at the theatre under its new name (it was previously the Finsbury Park Astoria). The tour featured the first live performances of “Baba O’Riley” (played with a synthesizer backing tape as was “Won’t Get Fooled Again”) and the return of a “Tommy” section featuring “Overture”, “Amazing Journey”, “Sparks”, “Pinball Wizard” and “See Me, Feel Me”. “I Can’t Explain” and “Substitute” began regularly serving as the opening songs, where they remained for many tours after this one. Demand for tickets was incredible with extra nights being added at Glasgow where 6,000 people queued for 3,000 tickets. The Who had just released the classic “Who’s Next”. “Who’s Next” had started out as a follow up to Tommy: “Lifehouse”, which was to be a multi-media project symbolising the relationship between an artist and his audience. Townshend developed his new ideas for the concept in his home studio, using lots of synthesizer and a series of experimental concerts were booked for the Young Vic in London. These concerts were originally imagined as a grand concept where the audience themselves would somehow contribute to the music and the performance. However, the concept proved too complex to implement and it eventually became a much more straightforward rock album, drawing from the “Lifehouse” music, and was released as “Who’s Next” in August 1971, reaching No. 1 in the UK and the US. “Baba O’ Riley” and “Won’t Get Fooled Again” were soon to become great live favourites. I arrived at the Odeon in time to catch support band Quiver, who you could rely on to warm up the audience. The Who exploded on stage to a massive roar from the audience, and for 90 minutes or so, played a loud, incredible high energy performance. Those opening songs of “Can’t Explain” followed immediately with no time for breath with “Substitute” just can’t be bettered. Townshend commented on the “Baba O’Riley” backing tape, saying “We’ve been waiting for the day that we’d stop playing before the tape finished, and this was it!” “Magic Bus” included a lengthy jam, with mouth harp from Daltrey and much arm swirling by Townshend. “Won’t Get Fooled Again” had recently been in the charts and was a crowd favourite, and a personal highlight of the concert for me. Townshend closed by throwing his guitar in the air, letting it crash to the stage, but didn’t smash it, even though the audience, including me, were willing him to do so, and shouting “smash it, Pete!”. An absolutely amazing gig, and for me the start of a journey with The Who which continues to this day. Setlist: I Can’t Explain; Substitute; Summertime Blues; My Wife; Baba O’Riley; Bargain; Behind Blue Eyes; Won’t Get Fooled Again; Baby Don’t You Do It; Magic Bus; Overture; Amazing Journey; Sparks; Pinball Wizard; See Me, Feel Me. Encore: This was normally My Generation; Naked Eye on this tour. However, published setlists suggest that these were not played at the Newcastle gig. My memory is patchy and I really can’t remember whether or not these two songs were played. I suspect they may have been, and that the setlist orginates from an audience recording which exists (you can find it YouTube) and which does not include the full set. I reckon I’ve seen the Who 19 times, so this is going to take a couple of weeks. I have already blogged about some of those occasions, but there are lots still to cover. 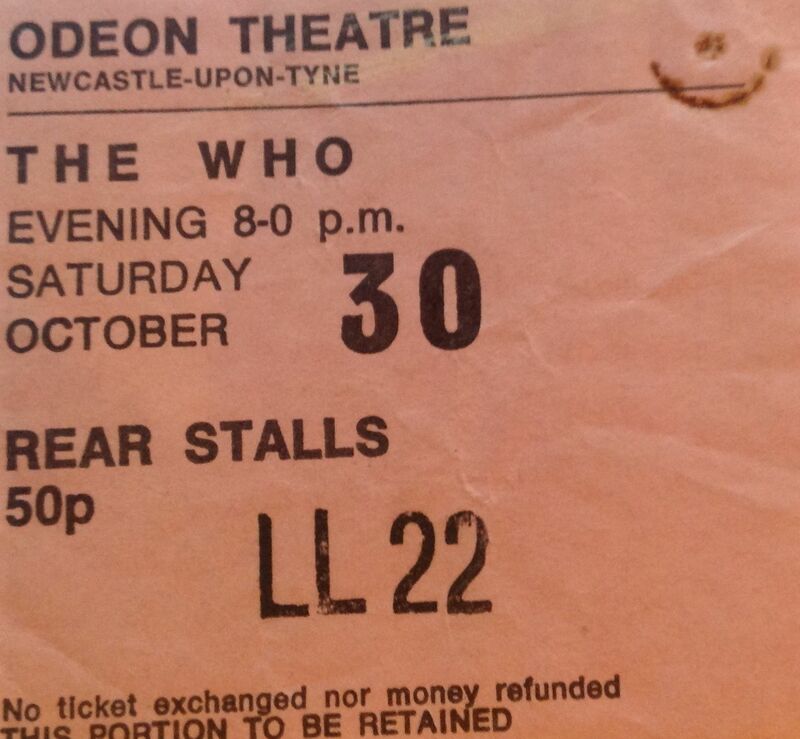 Tomorrow I’ll write about when the Who returned to the Newcastle Odeon two years later during the “Quadrophenia” tour. It is early 1972 and it all started with a question. “Who is the best live band?” The silly questions that kids ask each other, and that seem so important at the time. “Who is the best live band?”. The answers were usually Led Zeppelin (we had all seem them live a few months before and they totally blew us away), Free, Family (both bands were big favourites with rock fans in the North East), Deep Purple, The Stones, oh and T Rex. Eh? Yes one guy was insistent that the best band he had ever seen live was T Rex. We scoffed at this. T Rex? Hadn’t they “sold out” and become teenyboppers? Now if he had said Tyrannosaurus Rex (we would all nod sagely and knowingly when that name was mentioned) we might agree. 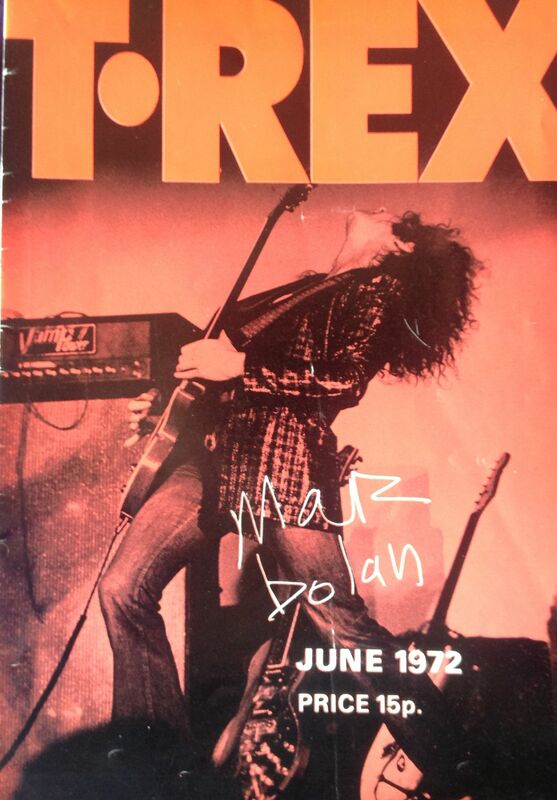 Tyrannosaurus Rex were cool, progressive, hippy and all those cool things. But T Rex? It’s funny how such trivial things are so crucial when you are young. My friend posed a challenge to me. 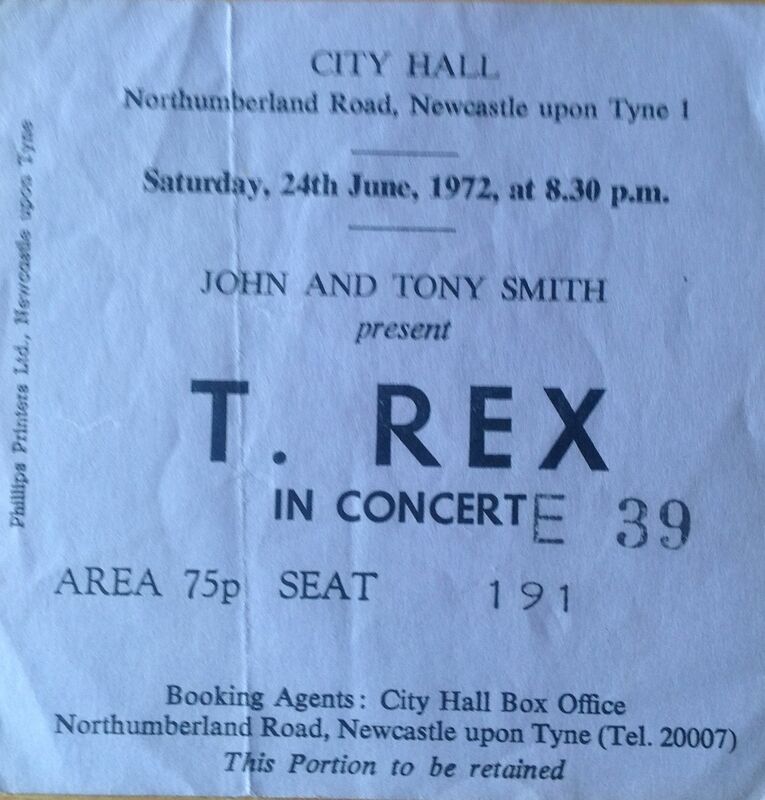 I had to go and see T Rex with him the next time they came, so that I could see for myself. I agreed. Roll on to June 1972. T Rex have announced a short tour and are coming to Newcastle City Hall. They are playing two shows, at 6.00pm and 8.30pm. Now being a man of my word I have to keep my promise. I’ve never see T Rex live. I missed out on seeing Tyrannosaurus Rex, which I regret, and at the time I secretly fancied seeing T Rex, but it had become too uncool to admit to that, or so I thought. Any way, I had accepted the challenge, so I had to go, and secretly I was quite looking forward to it. But first there was the task of getting tickets. 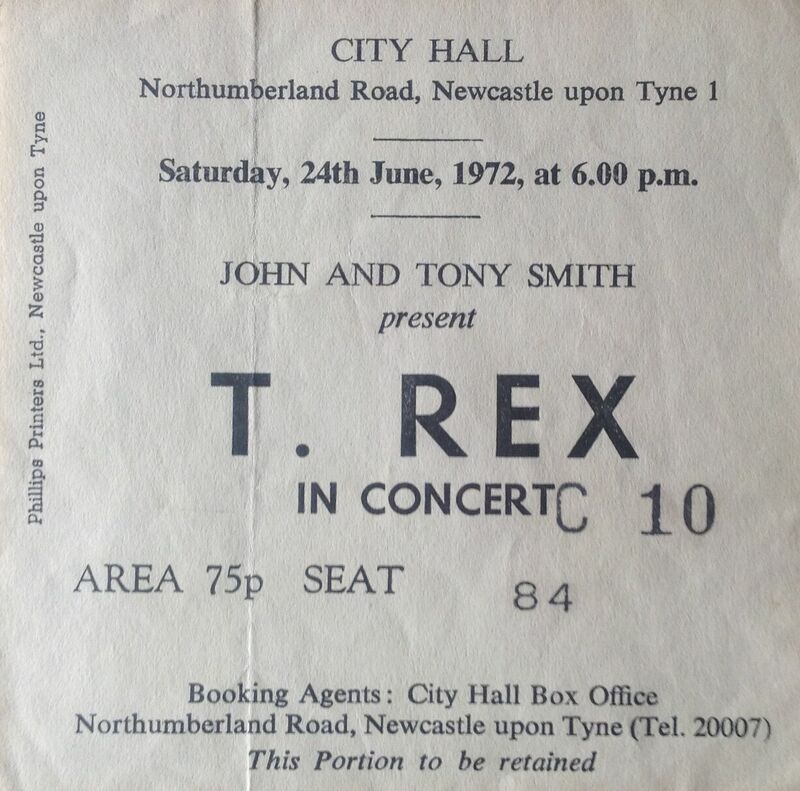 T Rex were the hottest ticket (with teenage girls) at the time. The tickets went on sale on a Saturday morning, and my friend and I agreed to meet early in the morning and get the train through to Newcastle, in time for the box office opening. When we arrived at the City Hall the queue was across the road and right down the street. A couple of policemen were trying to organise and control the crowds, but as soon as the box office opened its doors, there was a massive dash and the line of the queue descended into chaos. This gave us an opportunity to take our chances. We rushed to the front and managed to get close to the doors. We were planning to buy tickets for the late show, but as we found we were able to buy good seats, we decided to go to both shows. We ended up with seats in the middle of the third row for the early show and towards the side in the fifth row for the late show. Roll on to the night of the concert. We turned up at the City Hall early, as the first show started at 6.00pm. Support were Quiver (soon to join forces with the Sutherland Brothers) who played a short, excellent, set which was lost on the screaming Bolanites. The City Hall was packed with girls in their early teens, all decked out in satin clothes, with T Rex scarves, and glitter on their cheeks. Several were wearing a top hat, mimicking the hat that Marc was wearing on the front cover of the recently released “Slider” album. To call the show pandemonium is an under statement. The screaming started from the minute the house lights went down and didn’t let up until T Rex had finished their short set. Marc was resplendent, an elfin rock god in a glitter jacket. He camped it up to the delight of the crowd. Everyone around was screaming “Marc! Marc!” and crying, tears running down their faces. I swear we were the only boys in the front block. T Rex were incredible. Very LOUD, and you could feel the energy flowing out of Marc and Mickey. The set included a few of the hits, I think they started with their current single “Metal Guru”, some album tracks, and a short acoustic set where Mark and Mickey sat cross-legged on a rug; Marc with acoustic guitar, and Mickey with small bongos between his knees, harking back to the Tyrannosaurus Rex days. Great stuff. Marc played the part of the rock god perfectly, pouting and prancing around the stage. Wonderful. The set was very short, less than an hour, and then by 8pm it was over, and we back out on to the street to join the queue for the late show. Roll on to 8.30pm. If I’d thought the early show was crazy, the late show was total chaos. This time the fans were just that little bit older and that little bit more determined to get to the front and touch Marc. We had girls climbing over us, and were crushed from all sides. We ended up with girls on our shoulders (“Can I get on your shoulders, Mister?”), both (the girls, that is) screaming “Marc! Macr!” at the top of their voices. And is seemed even louder. My ears were ringing for days afterwards. At the end we had to run down to the station to catch the last train home. So, returning to my initial question: “Who is the best live band?”. My friend was even more convinced that no-one could match T Rex. And in some ways I could see where he was coming from. I’d certainly never been to a gig quite lack it for craziness and energy, from the band and the audience. But it’s like comparing the proverbial “apples and pears”. T Rex and Zeppelin were, of course, completely different bands. So we agreed to disagree, and although I 100% enjoyed my T Rex experience, I also remained 100% committed to Zeppelin, The Stones, Purple and others. But I did cross a line that night, and realised that “cool” wasn’t everything and that there was serious fun in seeing pop bands like T Rex, and serious merit in their music. From then on I stopped worrying about whether a band was cool, and if I fancied going to see them, I went. I was aware of The Sutherland Brothers and Quiver as two separate bands, and saw them both live a few times. 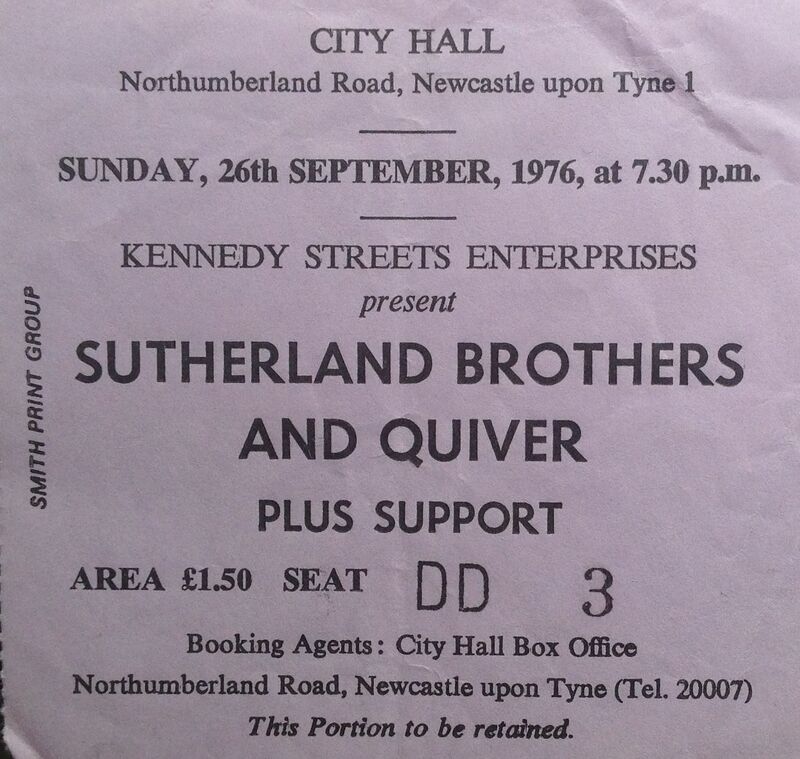 I saw The Sutherland Brothers at the Lincoln and Reading festivals in 1972, and Quiver as support for T Rex, and at Sunderland Poly Wearmouth Hall. They were two very different bands. The Sutherland Brothers an acoustic fold duo, who had a great 1972 single “The Pie” and the song “Sailing” which was to become a massive hit when covered by Rod Stewart. 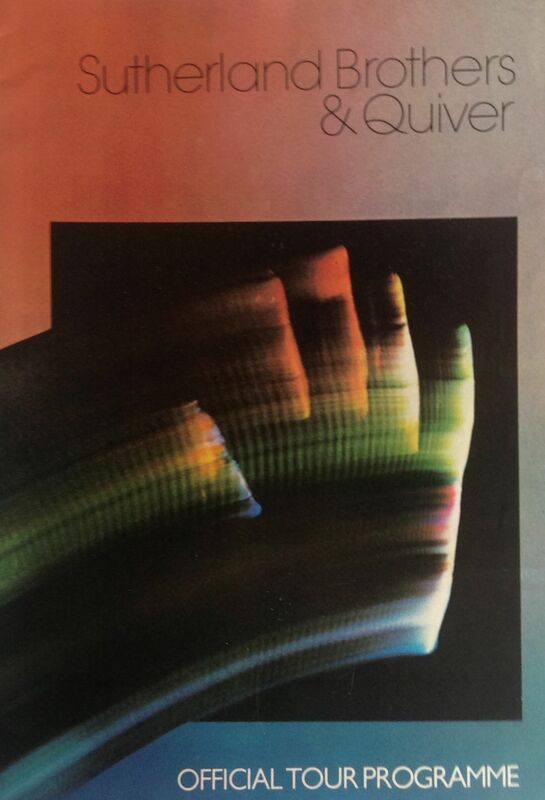 Quiver were a folky rock band, led by excellent guitarist Tim Renwick, and did a great version of The Beatles “Saw Her Standing There”. In late 1972 the two acts joined forces and became Sutherland Brothers and Quiver. This seemed to me to be a strange move at the time, but proved to be very sensible. They released an album “Dream Kid”, and the excellent title track was released as a single, which should have been a hit but sadly didn’t chart. The new band toured constantly; I saw them at the Reading Festival in 1974 and 1976, and at Sunderland Poly Wearmouth Hall on 5th December 1975. In 1976 they released “Arms of Mary”, their biggest hit, which reached No. 5 in the UK singles chart. They headlined a major tour at the time, calling at Newcastle City Hall on 26th September 1976. Support came from Moon, a successful pub rock band. The success was to be short lived. Tim Renwick left the group in 1977 and by 1979 the Sutherland Brothers had parted company with Quiver, and returned to recording as a duo. Sutherland Brothers & Quiver were a very under-rated band. The combination of the Sutherland Brothers’ great songs, and the guitar-based rock music of Quiver was a powerful mixture. Their live performances were always excellent, and their music crossed and combined genres including pop, country, rock, reggae and folk. There was so much more to them than their rather middle of the road (MOR) hit “Arms of Mary” might suggest. Perhaps that was the problem; a fine band who were difficult to pigeon hole, and landed a MOR hit, which gave them an audience who didn’t fully appreciate the breadth and depth of their music. That, and the advent of punk, probably sealed their fate. Listen to “The Pie” or “Dream Kid”.